The immense satisfaction of finding something unexpected, yet wholly delightful, amongst trees has to be hot wired into the most primitive part of our brains. 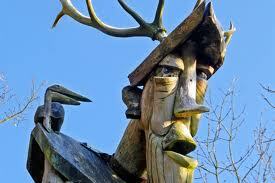 Rambling around Grizedale Forest looking for sculpture is one of our favourite days out. The tribe can run about to their heart’s content (waving sticks, climbing over logs and jumping out shouting BOO! ), whilst I stand still and contemplate art, and it’s only half an hour’s drive from the cottage in Broughton-in-Furness. Grizedale has the largest outdoor collection of site-specific art in the UK. Created over 30 years, it holds about 50 permanent pieces but nobody’s quite sure how many as some, inevitably, have rotted away. Last month, two new sculptures were added to the collection. “Concrete Country” by Lucy Tomlins is an out-sized concrete country stile and “Romeo” by Owen Bullet & Rupert Ackroyd is a carved oak totem. This was inspired by the story of Romeo, an urban fox who explored the Shard tower in London. Grizedale Forest also hosts temporary exhibitions and events, please check out their website to find out what’s on. Categories: Arts, Children, Lake District Nature, Things To Do | Tags: children's activities, Grizedale, Lake District art, local attractions, walking | Permalink. There is something deliciously exciting about being somewhere you are not normally allowed – especially at night. 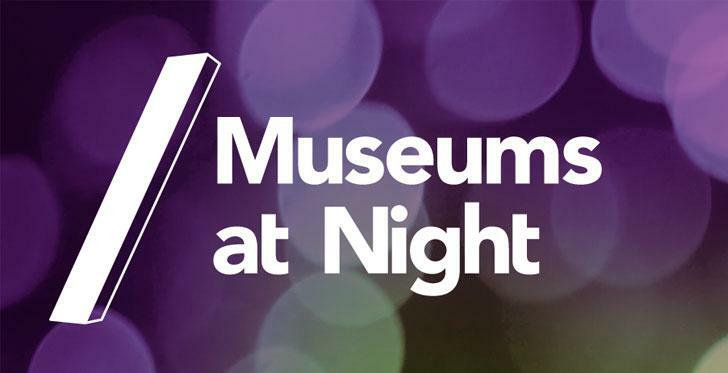 Here in the South Lakes there are some fun things to do over the 16 – 18th May as part of the national Museums at Night Festival. ‘a greeting of good ale’ 16 May 7.30-9.00 £4 Dove Cottage. Wordsworth is famously known as the “simple water-drinking bard”, but the archives tell a different story. Discover more about the history of Dove Cottage, formerly the Dove and Olive-Bough Inn, and enjoy a free beer and food tasting. Further details at The Wordsworth Trust website here. Arts & Crime, Murder at Blackwell 16 May at 5.30, 6.30, 7.30, 8.30. Free but limited to 15 so booking essential. You’ve mistakenly entered the end of a dinner party in the 1920s: what has happened and is someone still ‘at large’? Let the theatre company, Bear Necessities, lead you through Blackwell in search of the culprit. Further details at the Blackwell website here. Dozing at Dove Cottage 17 May & Secret Sleepover 18 – 19 May Dove Cottage Dozing at Dove Cottage, for 14+, will be an eventful evening of activities exploring the cottage, a bite to eat, and a movie marathon followed by the sleepover. Listen to some ghostly tales on the torch-lit trail and enjoy twilight arts & crafts activities before setting up camp in the museum for the night! The Secret Sleepover is for children aged 7 – 13 years old, but adults will enjoy it too – a minimum of 1 adult for every 5 children. £10 pp includes breakfast, accommodation and materials for activities. Further details at The Wordsworth Trust website here. Cranium Sculptorades at Abbot Hall 18 May From 6.00pm, games start after 7 until 10. Free event, just turn up on the night! Why stay in and play board games when the Lakeland Arts Trust team is challenging teams of visitors to a giant game of Cranium Sculptorades? Further details at the Abbot Hall website here. Categories: Arts, Children, Events, Lake District Poets, Local Beer, Local History, Things To Do | Tags: Arts & Crafts, children's activities, Lakeland Arts Trust, Museums at Night, Wordsworth | Permalink. 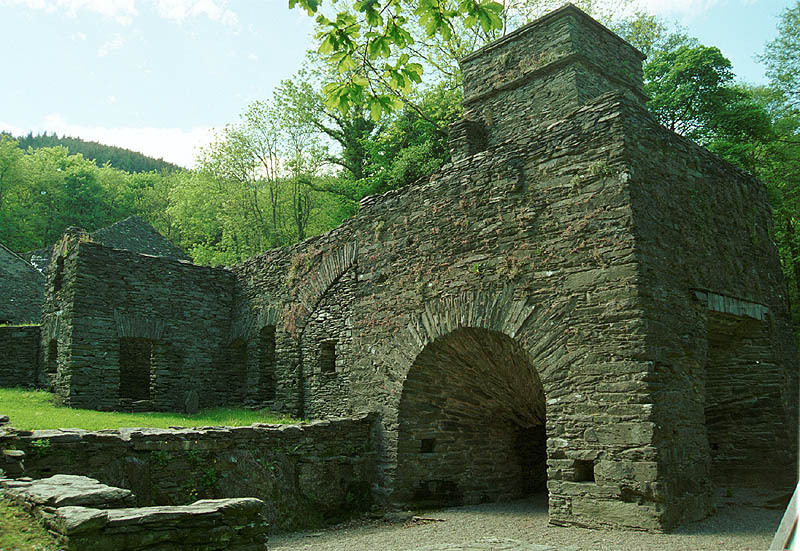 The restored remains of Duddon Iron Works are the most complete surviving example of a charcoal-fired blast furnace in the country and, happily for us, are just past the Duddon Bridge outside Broughton in Furness. It’s such a beautiful building, in a lovely setting and I marvel at the ingenuity and elegance of the Works. In the 18th Century, blast furnaces revolutionised the way iron ore could be processed. Large furnaces were built using water power to drive bellows which could pump air into the combustion chamber to create an intense heat. The water wheel is missing but the course of the leat (or stream) has been traced, bringing water from the river half a mile away. Higher up the hill is the charcoal store, 100 feet in length, and as high as a church. 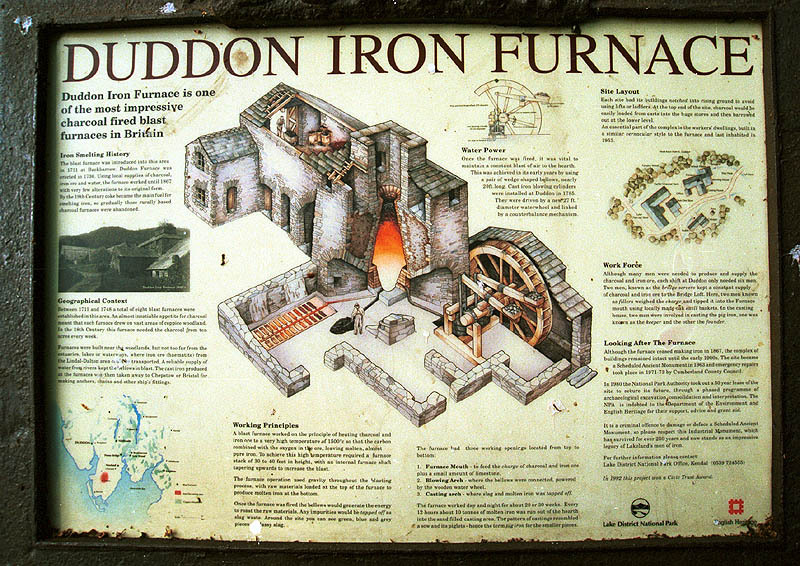 Duddon Ironworks was established in 1736 and operated until 1866, smelting iron ore bought in by boat from Millom. Pig iron cast here was sent to Chepstow and Bristol where it was used in the manufacture of anchors, chains and other iron work for ships. It’s called “pig iron” because the molten metal ran out at the base of the furnace into sand moulded into a branching structure of one central runner and lots of little ingots which looked rather like a litter of piglets suckling on a sow. The buildings are in the care of the Lake District National Park. At the site, this information panel gives a description of the various parts of the furnace and, in the drawing, you can see the ingots laid out. If you take the road out of Broughton, past the High Cross, towards Millom (A595), immediately after the bridge, turn right and the furnace is a short way along on the left and can be seen from the road. Categories: Duddon, Local History, Things To Do | Tags: Duddon, industrial history, local history | Permalink.